← Night of the Invasive Plants! As an undergrad at UW-Madison, my degree program was in Natural Resources Analysis. 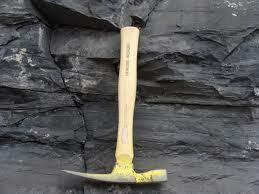 I loaded up my schedule with geology classes–my new-found passion. The most demanding by far was Economic Geology, taught by Eugene Cameron, distinguished professor and co-author of the reigning text book in the field. Though I won’t brag about my grade (a C+, as I recall)–the course was an eye-opener and continues to inform my perspective on any issue relating to the world beneath our feet–particularly the way water, gas and minerals move through rock. And so the controversy over hydraulic fracturing–aka fracking–caught my attention early on. 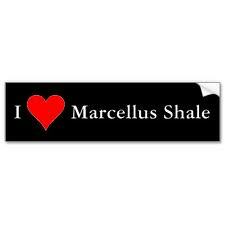 The Marcellus Shale is about a mile deep for most of its extent. 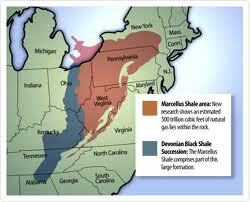 The Marcellus Shale formation cuts a wide swath in the Appalachian basin. Geologists knew it was gas-bearing, but it wasn’t until early 2008 that a new estimate of the natural gas trapped in the pores of the shale changed the game–the Marcellus Shale is now described as a “super giant” gas field. Ah, but how to get at it? Enter hydraulic fracturing: the extraction process that makes the gas field economically viable to industry–and promises a pay-off to rural landowners. Battle lines have been drawn between energy independence and economic development in the Great Recession on one side, and the authority of the Environmental Protection Agency to protect public water resources on the other. ProPublica has been doing great work on all aspects of this issue. A few days ago I scripted a video about fracking that is now posted on the start-up news website Track180.com. You can watch the video here. The House Energy and Commerce Committee is now reporting that 32.2 million gallons of diesel fuel or fluids containing diesel fuel were used in fracking operations in 19 states between 2005 and 2009. The probe did not find evidence of the diesel fuel getting into water supplies, but understandably, some are wondering what diesel fuel in your coffee would taste like. One last note: during a late-night drive last Summer, I heard an interview with the director of Gasland, the documentary that came out of Sundance and was picked up by HBO. The film went on to get an Academy Award nomination this year. Today, an article in the LA Times reports on an interesting twist: A group representing oil and natural gas producers, has sent a letter to the Academy of Motion Picture Arts and Sciences arguing that “Gasland” should be ineligible for best documentary feature because it contains inaccuracies. While other industries have launched public relations campaigns to discredit documentaries — health insurers targeted Michael Moore‘s “Sicko” in 2007, for instance — this is the first time an industry group has appealed directly to the academy. This entry was posted in Climate change + Culture, Deep Ecology, John Wackman blog and tagged Eugene Cameron, fracking, Gasland, geology.com, House Energy and Commerce Committee, hydraulic fracturing, marcellus shale, Michael Moore, Track180.com. Bookmark the permalink. I just spent a while reading this story, and others on your blog site….such good work and work for good. I live in the center of this big gas field (near Lewisburg WV), and I can see, and occasionally hear a mountaintop being removed across the valley from me….so these issues are very local for me. Of course EVERYTHING is local when it comes to degradation of our little green and blue planet home. I don’t remember reading or hearing about the movie “Gasland” when it was here last Fall. Thanks for bringing it to my attention. I’ll be looking for it. Great post!